The 2017 Nissan Maxima sedan boasts a fine balance of enjoyable road manners, head-turning looks and is a good value thanks to its mid-$30,000 starting price and long list of features. But despite this flagship sedan's larger size, it has less rear-seat passenger space than rivals like the Chevrolet Impala, Toyota Avalon and Kia Cadenza. 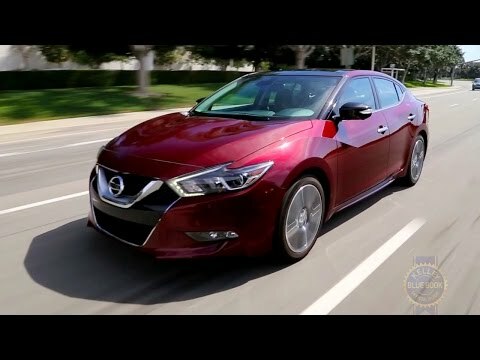 Nissan Maxima review: This car is a affordable luxury car. I love my Nissan Maxima! It has had no mechanical issues. This car has very good pick up when merging onto the highway. My average fuel consumption is 25 miles per hour in town. It is a little better on the highway. It is roomy in the back seat for adults to sit in comfort. I have the platinum series so I love the body style. The glass top is very sleek and looks sporty. The entire body style is sporty. I like the way it hugs the road in curves. I like the way it handles overall. The ride is smooth and very quiet. The sound system is good quality as well. The back up camera is nice because it has 6 point cameras and a overhead view when backing up. The guided lines on the monitor is superior when backing into a parking spot. The lines indicate which direction to turn and how close you are in between the parking lot lines. This feature also indicates the distance to the end of parking space showing you the closer view as you get near the designated spot. I like to use the back up monitor to make sure there are no children behind me as a back out of my driveway. This is a fantastic safety feature. Speaking about safety this car is one of the safest cars on the road. The overall performance, reliability and comfort is great. I would not hesitate to purchase another Nissan Maxima. Style and luxury at an affordable price. I would highly recommend this car. Nissan maxima, great overall vehicle, highly recommended. I think the Nissan maxima midnight edition is a fantastic vehicle and has a smooth ride, extreme comfort, moderate on gas and has a sporty look. Today I have had no issues at all and I take the vehicle to the Nissan dealership for regular services and the service departments are fantastic as well. I think the vehicle is priced fairly for what you get, it's a solid vehicle and has the feel and look of a luxury, sporty car. Very roomy and good size trunk. Loving my Maxima, for the third time! Just cannot get enough! I love my Maxima! It is a great car, reliable, fast and stylish. It is my third one in a row, and this one feels like you are in a jet! They keep getting better! The seats are very comfortable and there are a lot of cool accessories to add. I have the sport features with a spoiler which I think makes it pop. It is a sleek looking car and drives like you are flying. I love taking a quick corner and feeling totally stable!